Many of Spider’s configurations are contained within the web.config file on the root of the website. The user friendly way to access this file to make changes is through the “Portal Administration” control. 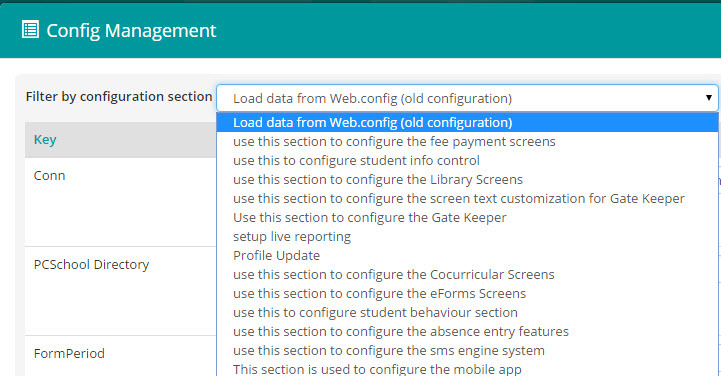 As well as the web.config configurations, there are specific setting for other modules which are selectable from the drop down menu. When saving changes to the web.config, Spider will restart itself, causing users to have to log in again. This does not occur when making changes in the other menu options. A few specific settings currently aren’t accessible through the Spider Configuration Editor, for example the keys relating to Active Directory (AD) authentication. To access these, find the “web.config” file in the Spider’s installation directory (i.e. ..\Spider\web.config), and edit it with your preferred XML editor. To enable AD, the “SecType” key under the “secSettings” element should have a value of “AD”, and the “domain” key under the “appSettings” element should have an empty value (i.e. value = “”) unless otherwise advised by PCSchool. The following keys are editable from the Configuration Manager. DocumentManagementFolderPath Path to the Document Management folder. It is suggested to use a UNC path the same as below. SMTP_AUTH_USER If sending through an authenticated mail server (Gmail), then a valid user is needed for authentication. SMTP_AUTH_PASSWORD The authentication password for the above user. HOME_URL The external URL of spider if you have one. Otherwise the internal address. COMPANY_NAME The name that should appear on the notifications sent out from the Spider. This is generally your school name. ABSENCE_REVIEW_INCLUDE_ROLL TRUE if you want the absence review to include roll statuses. This will slow down the screen a lot however. MARKBOOK_SELECTION_BGCOLOR The background colour for the currently selected column of the markbook be. OPTIONAL_PAYMENTS_CAPTION The caption that should be shown for the “Optional payments” section in the “Pay Student’s Fees” control. SHOW_STUDENTINFO_FROM_ABSENCEENTRY If the value is TRUE, then spider shows the student info when the “i” button is clicked from ABSENCE ENTRY v2. LOAD_DEFAULT_EMAIL_AUTHENTICATION If the value is TRUE, then the authentication username/password is loaded as per the Spider config. This is normally used by schools who require authentication for sending emails and who are using BULK EMAILING in Spider. In most cases bulk emailing in spider uses these authentication details. 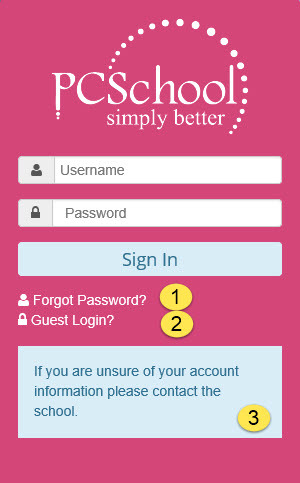 When using Behaviour Notes (version 1), the “DEFAULT_BEHAVIOURNOTE_TYPE_V1” key determines which type of note will be populated first when behaviour notes is run from “My Classes” or “Absence Entry.” Both of these controls load the entry screen by default, so the type will be now be based on above selection.